Nicolle Zellner is an Associate Professor of Physics at Albion College, where she teaches general astronomy and upper-level physics courses. Her research interests focus on understanding the impact history in the Earth-Moon system, the extraterrestrial delivery of biomolecules, and how impacts affect the conditions for life on Earth. Nicolle actively engages in professional and public outreach activities, including invited talks and observing sessions. Hi. My name is Nicolle Zellner and I teach at a liberal arts college. I imagine your collective reply would be “Hi, Nicolle”. Privately, though, you might say to me, “Wow. You must teach a lot.” or “How do you find time for research?” or even “Too bad you had to give up research.” In the snarkiest of all comments, I’ve heard “Wow. You couldn’t do research so now you have to teach”. My goal today is to change your mind about what it means to teach AND do research at a liberal arts college. I’ve been at mine for seven years now. In the past two, I’ve been very successful in receiving NASA and NSF grants, and I am looking forward to starting to publish the results in the next year or so. I made a conscious decision to pursue career opportunities at a liberal arts college because I learned early on that I did not want to be subjected to the whims of Congress or NASA and thus (possibly) be affected by limited federal budgets. One of my best life experiences so far was participating in the WUPPE (STS-67) mission in 1995 but when the mission (and accompanying money) ended, so did my job. Our students think it means a small college where you have access to professors 24/7, but most of the faculty would agree with the definition given by the Encyclopedia Britannica: a “college or university … aimed at imparting general knowledge and developing general intellectual capacities in contrast to a professional, vocational, or technical curriculum.” Generally, liberal arts colleges are undergraduate only and residential in nature, but a growing number are starting to include Masters degree programs, a limited number of PhD programs, and an on-line component, as ways to increase revenue. For the undergraduate student, part of acquiring “general intellectual capacity” means that s/he is required to take a limited number of classes in all divisions (e.g., Natural Sciences, Humanities, Social Sciences, and Fine and Applied Arts, though different colleges might use different names), for a broad educational basis, in addition to specific courses required for the major. Sometimes the educational component can include significant research experience or an internship (or two) but it always includes being involved in many clubs and other organizations that serve to “credential” the student. For the faculty member, “imparting general knowledge” usually means that we teach many students (e.g., 25-50) in service courses (e.g., Astro 101 or Physics for Pre-Meds) and smaller numbers of students (e.g., 3-10) in courses required for the major. A friend (thanks Diego Fazi!) 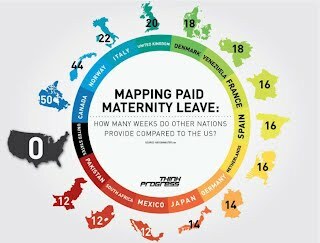 recently posted on facebook the image to the left, showing various national policies for the number of weeks provided for maternity leave. Click here for the raw data. Yes, men and women in other countries face other obstacles in achieving work-life balance. This figure is simply pointing out the reality that the Family Medical Leave Act falls short and didn't have to. The most progressive and useful of the policies provide both maternity and paternity paid leave. Gender neutral policies reflect the reality within our community in which most early-career couples are dual career couples and child rearing is shared by both parents. Gender neutral policies reinforce the message that shared parenting is valued and respected within our community. Norway: 54 weeks (12.5 months) (80%) or 44 weeks (10 months) (100%) - mother must take at least 3 weeks immediately before birth and 6 weeks immediately after birth, father must take at least 6 weeks - the rest can be shared between mother and father. Let's narrow the focus now to our small astronomy community. For a list of current family leave policies for astronomy graduate students and postdocs in astronomy departments in the U.S. (and to add your department's policy if it's not yet listed), please click here. In terms of bringing change: Already, ~1100 astronomers have signed our petition, voicing their support for improving family leave policies for graduate students and postdocs. I encourage you to sign, and more importantly, find out what the policy is in your department. Dave Charbonneau (CSWA member) is currently compiling responses to his survey of astronomy department chairs of current policies and practices with regards to family leave, adoption, and childcare for astronomy graduate students and postdocs. Once we have those results, we will share them with the community. 6. Free webinar on "Everything you wanted to know about physics grad school"
After years of paper applications with no real interview process, I found myself faced with the difficulty of several interviews this academic year. In fact, the only real interviews I had until this point were all during my undergraduate career, so this process was particularly daunting. Making the leap to that next level of a staff or faculty position requires the inevitable interview and this article shares some of the things I learned after going through it all for the first time. First of all, every school is different! You can read over and over the interview advice found on-line (for instance: this and this), but chances are that your experience will be different. I know that mine was! On-campus interviews are quite comprehensive. Often you fly in the night before the visit. You are likely to meet with nearly all members of the astronomy/physics department. This takes the form of ~30 min meetings scheduled right in a row and forms the backbone of the campus visit. The only breaks in these meetings are for meals, which also include meeting with a sub-set of the faculty, and your research talk. 3. Remaining competitive and sane: The 40 hour work week in science? Guest Post: Catherine Neish on Remaining competitive and sane: The 40 hour work week in science? Catherine Neish is presently a postdoctoral fellow at the Johns Hopkins University Applied Physics Laboratory, and will be starting a NASA Postdoctoral Fellowship at Goddard Space Flight Center later this summer. Her research focuses on radar remote sensing of planetary bodies, such as Titan and the Moon. Remaining competitive and sane: The 40 hour work week in science? The forty hour work week. It’s a standard length for many American workers, but it seems to represent more of a lower limit for many scientists. Discussing your plans for evening or weekend work is not unusual in our field; indeed, in this competitive, type A environment some may argue it's necessary for success. I'd like to suggest it's not. Indeed, I think many of us could be better scientists if we worked forty hours a week. Or less. Not that I don't feel the impulse to work. I do. I worked hard throughout my K-12 education and on through my undergraduate degree in astronomy. It seems quite distant now, but there was a time in my life when my almost all of my time was spent in class or doing homework assignments. I remember one occasion when I had to pull myself away from my quantum mechanics homework to see a wonderful display of the Leonids meteor shower (and boy I'm glad I did!). Ann's post last week inspired a number of comments, several of which expressed dismay at her frank description of how hectic life can be when you're trying to balance astrophysics with raising a small child. And while, yes, life with kids can be quite difficult at times (it would be disingenuous to say otherwise), I would also say that it doesn't mean you need to choose between work and family. Part of that is because it simply gets easier. Eventually, your child sleeps through the night. Eventually, your child will dress himself/herself in the morning. Eventually, your child will discover the joy of reading and will sit still for long periods of time. Eventually, your child will carry her/his own bag through airport security (and until age 12, can keep her/his shoes on). My kids are now ages 8 and 10, and these days I lose more sleep over proposal deadlines, preparing lectures for class, red-eye flights and jet lag, and other activities typical of any busy theoretical astrophysicist, with or without children. I am also known to forego sleep to squeeze in some early morning exercise, or because of my inability to put down a good novel. My kids are a real joy to me these days. I attended their school music programs and got to watch them showcase their talents on stage, and I am as proud of them as any doting mother can be. They help out around the house and they (mostly) listen when I tell them it's time to get up/go to bed/get ready to go. Last Sunday was Mother's Day, and they made me breakfast in bed, which included an omelet and fresh brewed coffee. My husband only had to supervise them minimally. Yes, there are still challenges, especially juggling 4 sets of schedules at once. And I do fear the teenage years ahead. But I know my life is richer and more joyous with my children than without them, and all my lost sleep is well worth it. *I was originally going to entitle this post "It Gets Better," but I didn't want to cause any confusion with the laudable initiative for LGBT youth of the same name. Kate Follette is a graduate student at Steward Observatory and an adjunct instructor at Pima Community College in Tucson, Arizona. Her scientific research focuses on planet formation in circumstellar disks, and she is also engaged in educational research on mitigating quantitative illiteracy through introductory science courses for non-majors. I had an interesting discussion recently with a well-respected senior scientist about the benefits of pedagogical and communication training for graduate students. This was in connection with a proposal to start a graduate course on that topic. I mentioned that I was surprised that such a course was not already offered and, more than that, required as part of our degree program. This wasn’t an intentionally radical statement. In fact, the benefits of such a program seemed clear and abundant to me, so I was surprised at how our conversation progressed. He countered immediately with an argument that I’ve heard before – “not all graduate students will be required to teach in their future careers”. This one didn’t faze me too much, and I already had a practiced response. I told him that this was probably true, but that pedagogical skills are essentially communication skills. The majority of us do have to teach in some capacity during our careers, but more than that, virtually all of us have to give public lectures, write grants, and interact with people who want to hear about what we do, and this kind of training can make us better at those as well. 2. Girls Like STEM! How can we translate that interest into a career? 5. Why Aren't More Women in Science Fields? Sleep or live? OK, I choose to live, more on motherhood and astrophysics. We are now at 25 months since the birth of my daughter and I’m not dead yet. Why did I put it that way? FYI, if you don’t read to the end of this you’ll think I am truly miserable. Everyone is occasionally miserable, but that really isn’t the point at all. Recently I had two back-to-back work trips. The first was a science conference in Spain and the second was a collaboration meeting of a small research team at Northwestern University in Chicago. Due to the consecutive trips, I did a fast turnaround to Europe. I spent 3 nights in Spain and lost one night to the flight over to Barcelona. I had just one good night’s sleep over those 4 nights and then returned to my 2-year-old in Maryland, packed again (her stuff and mine) and headed to Evanston, IL. I had decided not to leave my daughter for two weeks in a row (which would have been unfair to my husband too). Inbetween the two trips, instead of sleeping, I had a late night out with my husband to reconnect (which was wonderful) and then off we were to Chicago the next day. The flight on Sunday was my daughter’s first with a plane ticket (kids have to have their own tickets at age two these days) and she did not sleep and did not hardly sit still the whole time. I got to spend Sunday afternoon/evening a bit tired but in the company of my brother/sister/in-laws, extremely cute baby nephew, my daughter and parents. We ate pizza and drank wine. I had only three nights there, but in what appears to be a tradition for our trips to Evanston, my daughter got up at least twice every night. The flight back home was a bit miserable. There was a horrible security line at Midway (an hour of inching forward) during which for some time the only thing that kept my daughter from crying was holding her upside down which amused other people but made for an even more tired me. She was a nightmare on the flight and I was so tired I hardly cared. I missed most of the next day of work due to physical exhaustion. You might think I was pretty stupid for having attempted all this. Shouldn't I have just stayed home? The trip to Spain was WONDERFUL. I would say 85% of the talks were excellent. The topics included ISM chemistry, cosmic ray acceleration and star formation processes. There were 70 people in attendance in what was described as an experiment to bring together normally distinct groups. On top of this, at every coffee break, lunch and dinner I met interesting people doing relevant research and/or working on projects related to my programmatic work. Since I was sans-child I also enjoyed the red wine and late night conversations. I will say I was FIGHTING the urge to just go back to my room and sleep but I was determined to participate fully. Again, instead of sleeping on the plane (which I don’t really do anyway) I watched FIVE movies. Heaven! The NU trip involves my core research and about eight of my favorite collaborators. The conversations were about our papers about to be submitted and our next plans. We had pleasant lunches and a nice collaboration dinner. I got to do this and see my brother, parents and daughter every night. So that brings me back to a decision I recall making when my daughter was a couple weeks old. I was exhausted and all I wanted was sleep. My husband asked me to watch a movie with him. Why on earth would I remember, among all the moments I cannot recall, this particular conversation? Because I remember thinking: I’ve got a choice here: sleep or live. Two female astrophysicists backed me up recently on these sorts of decisions. One of my friends said she decided her life was crazy but she would both work hard and play hard. A colleague who is a mother told me that she suspected that my trip to NU was very “rich.” This was true. The cost was physical exhaustion, but in exchange for my family and the research I love, I will gladly pay. Don’t worry, I crashed when I finally got home. Guest Post: Julia Kamenetzky on Girls Like STEM! How can we translate that interest into a career? Girls Like STEM! How can we translate that interest into a career? When discussing the representation of women in STEM fields, it’s important to ask: are girls even interested in science? Proponents of gender essentialism, the belief that men and women are fundamentally different, might assume that women are underrepresented in STEM because they simply aren’t interested. Why should we push people into careers that don’t interest them? Or perhaps even worse, why should we push people into careers that they aren’t “good” at? Recent research, however, has shown the opposite to be true. Girls are just as good as math; the rapid increase in the ratio of girls to boys receiving top scores on the math SAT shows that there was nothing biological about test scores, and high school girls perform just as well in math and science in school (AAUW). This idea is nothing new, especially to the readers of this blog. I’ve instead chosen to focus this post about the first question: are girls interested in science? The answer is yes! More importantly for the readers of this blog, how can we use these findings to change the way we approach outreach and education? I got this link from AWIS, the Association for Women in Science. Their LinkedIn page gives a lot of great resources, and they offer many excellent professional development talks and workshops to members, usually through their many local chapters. Most important to me, they provide a community of people committed to advancing women in science, with many practical tips for all.